So it's one of those days on the internet. It seems I have a young guy with a homosexual crush stalking me online. There's this deranged young man whose name is Craig from what I've read online. He loves to stalk me and my followers. Any chance he gets, he tries to discredit me, or try to show that I am being deceptive. This guy I believe has autism from what I remember. He had messaged me in my old account and did nothing but troll and take on a contrarian role. Anything you tell him, he will try to distort and rationalize to appease his fallacious reasoning. If you say a triangle has 3 points, he will say that it has 2 and will do anything to try to prove his point. The guy obviously is mentally ill and needs professional help which he will not find on Twitter or elsewhere. First, he will defend "Rosa Rubicondior" to death. There is no way you can show him that "Rosa Rubicondior" is a liar and fraud. 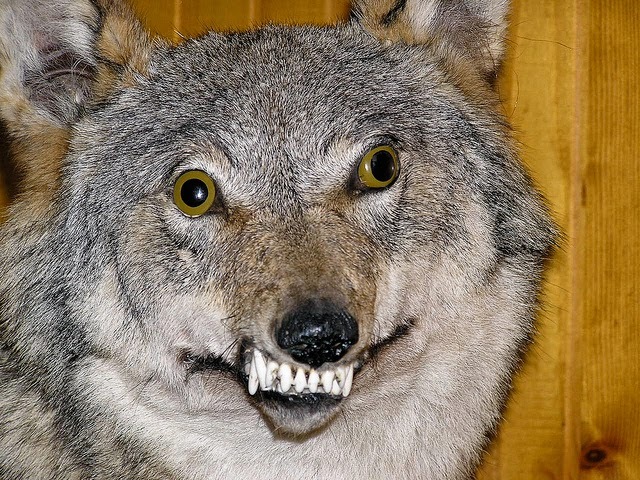 Even one atheist young man showed him evidence that I am not this high school boy from a Bronx school who "Rosa Rubicondior" mentions in a defamatory blog post, and this "wolf" guy still will not accept it. We are talking about actual documents from the school itself! If he doesn't believe the people who run the school, who will he believe? This is why it's obvious he is either mentally ill or just trolling to get some kind of sexual high off of a pseudo sense of power by trying to "outsmart" or annoy people. The guy is seriously troubled. You can tell him that a cup of milk is milk and he will still say it is white paint. He will say "it is white and a liquid, therefore it's paint" until he turns blue and will never accept the reality that the cup of milk is in fact milk. This is a self defense mechanism called rationalization. Rationalization is when one tries to justify the unjustifiable or tries to use logic and reason in order to make excuses despite the logic and reasoning being fallacious. Recently, it seems he started his own blog and took some of my material without permission. He also broke the terms of copyright posted on my site by not back-linking to the links where he got the information. I have already filed a report with Google's legal team regarding this and ask my readers to do the same. I have no problem with people using my content; however, the rules I presented for fair use must be followed. Moreover, he has emailed me a couple of times asking for evidence of the Oxfam "Rosa Rubicondior" scandal. I told him I would post it in the near future and he took it as I was being deceitful. Makes sense right? Someone tells you that he/she will post something in the near future and you call him/her a liar. I will never succumb to pressure to do things against my timing. When I did post some of the evidence on a video preparing my readers for the "Rose Exposed" post coming up on Halloween, he quickly said it was not authentic. He even tried to say something about purple lettering and even posted a link to a page which ironically states that Google does use purple text in email. A few hours ago after I posted a meme showing the low hits David Viviano had compared to my radio show, Craig took to his account to discredit the meme saying that the numbers are for "all time" and not the current show. I had emailed him the same meme and he tried to disprove it via email as well even to the point of getting upset. On Twitter, a follower of mine explained to him using edited screen shots that the all time listens and live listens are not connected. Craig did not want to hear it and insisted that I lied about the listeners. He would not take the facts at hand as valid and would still deny it. After a few tweets, he then posted another screen shot of the host site for radio shows trying to show that in fact the live listens are part of the all time. However, that same screen shot proved my point and that of the follower trying to explain it to him. Craig still did not want to hear it and insisted on calling me a liar. I then posted the graph on my own twitter that shows the listens for each date/show which is demonstrated on the screen shot Craig posted. What was his response? He writes that it wasn't labeled and insinuated that the screen shot of the graph that I posted was not mine! Can someone say in denial? How can I have access to another person's account to be able to take a screen shot of it and use it as my own? Moreover, the dates match the exact dates for the most recent shows! Eventually Craig got upset and bowed out threatening to block the follower explaining it to him and refusing to mention "Sacerdotus" again (thank God). He was busted in a lie and ran out of rationalizations. This is when he gets upset after his lies are exposed and he runs out of excuses and rationalizations. This is the defamatory post he wrote that he continued to update. He even posted some of my emails there to make it seem like I am the bad guy. Please report this blog. I will tell you how at the end. This is his response when one of my followers tells him I don't have access to other people's account and tells him to compare the graph I posted with the dates of the shows I aired so he can see that the graph is indeed from my account. Notice he says it clearly, "didn't accept his graph." He will not accept any evidence at all unless it agrees with him or "Rosa Rubicondior." This guy is extremely biased and will reject the truth to defend lies. Here is when he gave up after the screen shots posted showed that he was lying and trying to discredit me. This is when he is trying to convince people that my show did not have 340 listeners halfway into the airing. He doesn't know how to read charts. Here he claims there is no proof, yet I posted screen shots of my account. Naturally, I cannot post all of it because it contains information that people can use to go on my show or change my password, so I am limited to what I can show in a screen shot. Here he rationalizes again by claiming that the graph is uncited. How can you cite a screen shot? Are they available in journals or libraries? This guy is clearly a troll who likes to argue or counter just for the sake of arguing or countering even if he is looking stupid doing it. 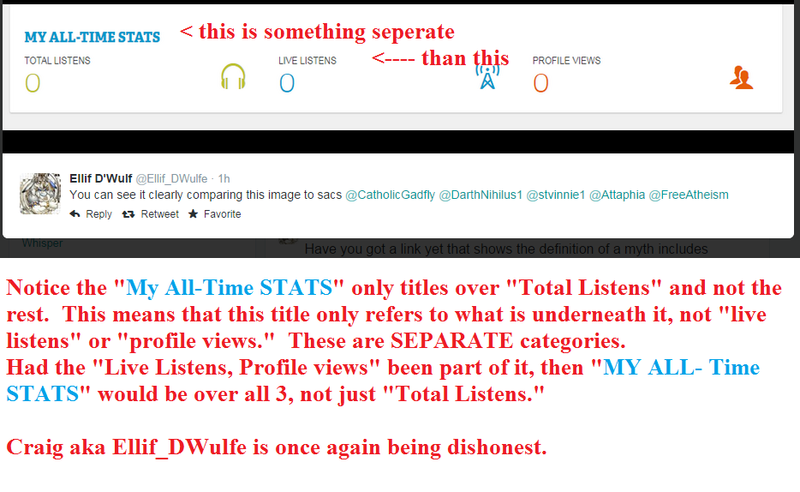 Here is is showing his confusing regarding "All time stats" by claiming that all of the categories fall under this one when it is only above the "total listens." Here he admits what I and my Catholic follower were trying to tell him. The capture shows the listens for a live broadcast! You can see clearly that he is not thinking well and just puts information out there without realizing that it's countering his argument! Here he sarcastically dismisses the graph showing the number of lives for each date/show. Ironically, his screen shots are not cited and he wants people to accept them, but if they come from me; he wants them notarized... Troll anyone? Here he is being skeptical by demanding that my Catholic follow show him where the chart indicated that it's for a live airing. If you see the entire page, you can tell that it keeps track of each live airing as well as archives. Here is shows his confusion on how to read the dashboard information and insists that everything listed is for "all time." Here he shows his delusional mind in regards to thinking that Catholic twitter accounts are me. He thinks that this Catholic follower is me and wants "me" to accept his claim that I am lying. Is this guy serious? He wants someone to say they are lying because he thinks he/she is lying? The evidence doesn't lie. There was no lie here. He was the one making up stories in an attempt to discredit my success. Once again, he tries to infer what the screen shot he had provided stated, ignoring the graph that shows EACH live episode. Here you can see his lie and confusion. He thinks that "live listens" means all of the listens since one first used the radio service. This is not how it works. "Live listens" are the listens during ONE LIVE SHOW. "ALL TIME" is when it lists all the listeners from ALL lives shows and the times it was listened to in archive form. Here he seems to not understand that the live listens updates and people join in to listen. It is like my blog counter which changes every time someone visits. At the time (11:15 PM) I took the screen capture, there were 340 listeners on it. Here once again he tries to infer what is not there. "Live listener you've ever had" is related to the graph above this statement that shows EACH show and the listiners both live and archived for each date. Here he posts a screen shot and tries to distort what it means thinking people are naive enough to fall for his explanation when we all can read data charts. Here is again skeptically asks to show how the data is for one episode without ever using the service and ignoring the chart above that shows each episode and its listeners. Here he shows his confusing by attempting to say that all the categories fall under this when "My all time stats" only falls over "total listens." He doesn't understand or willfully ignorant that when information is meant to be linked to a title, then the title will cover ALL OF IT, not just part. Here is is posting more distortion which was explained to him as being erroneous. See the confusion? He thinks the header that is ONLY over "Total Listens" also includes the other data categories. Here he is making no sense and shows his confusion. He cannot keep up with his lies. Despite the title being over "total listens," he insists that it includes live listens etc. How can "total listens" include "live listens" if live ones are in the present and total are the ones counted which means those in the past? It seems Craig has problems perceiving time. This is not the first time. An atheist even showed him that "Rosa Rubicondior's" claim that I went to a seminary in a post didn't make sense because the seminary "Rosa Rubicondior" named was closed more than a decade before I was born! Here he is accusing me of lying when the information is clear on the screen shot and he even admitted that the screen shot showed live listens. Once again he is distorting information on a screen shot in order to substantiate his claim that I was lying. Ironically, his own screen shots proved I was being truthful. Another distortion based on his drive to discredit me at all costs even that of making himself look like a moron. As you can see, this guy has been targeting me out of spitefulness, envy and hate. He will jump to defend every atheist and will always attack me instead even if I am in the right. Craig has a lot of anger and hate inside which is not healthy. We can help him by getting him removed from Twitter and blogger. People like him should not be allowed to use these services to harass others. We have enough hate in the world. Do we need an angry British kid attacking people while at the same time making himself look stupid? Craig has nothing to offer but his sociopathic tendencies which he makes no attempt to hide. He clearly has it in for me as if I murdered his parents or something and he has to get back at me. I truly hope he gets help before he carries out his warped perceptions onto the real world. Please avoid, block and report this troll account. He is nothing but an angry person looking to harass and deny anything you tell him. His bias blinds him to the point that he will deny reality in order to justify his delusions. That's one reason I don't do... active apologetics anymore. There are too many people that aren't interested in real discussion. It's a waste of time. Do not be discouraged. The seeds are being planted and will sprout.